Time has a really nice photo of the Resolute desk plaque. Former First Lady Barbara Bush attended this year’s WH Easter egg roll, along with former Presidents Washington, Roosevelt 1, Lincoln, and Jefferson. Former football great Troy Aikman read One Fish, Two Fish for some reason. 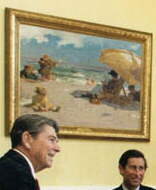 I found the enclosed picture of the Reagans with Prince Charles and Lady Diana in the Yellow Oval Room [actually the West Sitting Hall] and though I’ve searched all the web, I couldn’t know who is the painter of the impressionist beach scene hanging on the wall. The painting in the image is entitled: At the Seaside by Edward Potthast. This painting was borrowed from a private collection and is shown hanging in the West Sitting Hall. I’m currently working in far-flung Rancho Cordova, California, near Sacramento, which Google places 6 hours away from the Reagan Library in Simi Valley and 6-and-a-half from the Nixon Library in Yorba Linda. I think I’ll plan to stay over one weekend and visit those locations as well as San Francisco. Does anyone who has visited those libraries have any travel tips? Traveling on business, I have the luxury of staying overnight in that area, giving me a jump on the next day. I just looked at the Web stats for the WHM for the first time in several weeks and found that traffic is up considerably. The site first broke 30,000 page views a week in February of 2007 and held steady thru-out summer and fall until December, when visitorship went up markedly. Since then, we’ve been enjoying about 60,000 page views a week. Welcome to everyone who found us in the last couple of months! Got a note asking about the box with the medallion on top that appears in some of the photos for the President’s Dining Room. It’s quite prominent in the one I added recently. A similar box appears in photos of the Cabinet Room. I believe these are buttons the president can use to summon a White House steward into the room for more water or to clean up a spill or something. Anyone with more info? Are they radio controls or wired? I think that presidents have had similar call buttons since the house was wired for electricity (and bell pulls before that), but this president seems to like to keep his on display. I’ve changed the front page to the 1982 Green Room, a nice bit of color in the gray weather.